Manuel Alvarez’s work requires both artistic and technical skills. 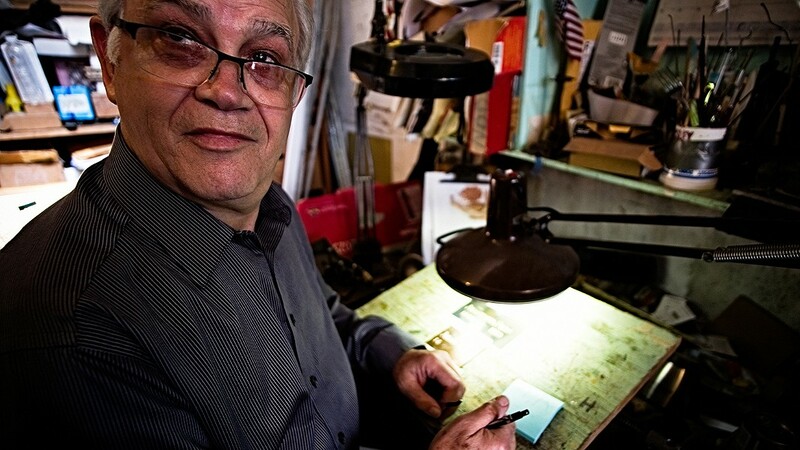 Artisan engraver Manuel Alvarez is a man of many letters whose value, ironically, is difficult to put into words — that is, according to David Madden, general manager at Chapel of the Chimes Hayward. Co-worker Matthew Farvall can sum up Alvarez's impact using only one word. "Care. That's everything," Farvall said. "In this industry, we provide a service, but in Manuel's way, there's higher passion." After 34 years as an urn engraver at Chapel of the Chimes Oakland, the 69-year-old Fremont resident is retiring. Sort of. "After I retire, I will paint, do sculpture, make art," said Alvarez. "But I'll come in whenever they need me. It may take a while to find the right person." Alvarez, a former high school art teacher, first learned the basics of engraving from a cousin who was a jeweler in Mexico City, his birthplace and where he lived until he met and married his wife. At 32, he was granted two-years leave to join her in the United States. For work, he filled commissions for art, including a version of Salvador Dali's The Sacrament of the Last Supper. "One day, looking at ads for steady jobs, I saw one for Chapel of the Chimes. It said 'metal engraver, knowledge of all English letters,' something like that," he said. "Because of my artistic background, I figured it wouldn't be so hard. I went to apply. I guess there was a pretty good need because they grabbed me." Eugene Westerlund, his predecessor, was an interesting teacher. "He was deaf and mute," said Alvarez. "He'd hand me a tool, show me what to do. He had me copy a name onto an urn. I learned fast that it's a one-shot deal. You can't scratch an urn and cover it up." Three decades later, Alvarez has learned other lessons: that each hand-held tool used to "walk" on an urn requires a different approach; that letters even within the same font can have five variations, or more. Primarily, he has learned that the human hand will never be entirely replaced by machines. His story is a 34-year evolutionary tale from ancient craft to state-of-the-art software, as evidenced by his workshop. On shelves and tables, you can find traditional mallets, metal stencils, and hand-held engravers known in the trade as burins, along with pencils, pens, paint brushes, hardhats, jars of instant coffee and peanut butter, Tiger Balm, a fire extinguisher, and a computer. A Persian rug, worn but still beautiful, lies beneath a modern Newing-Hall engraving machine that bears a blue foam pad affixed with duct tape to a crossbar. The blend of old- and new-fashioned gadgetry arises largely due to a workplace injury sustained by Alvarez. After 10 years of using hand tools to carve the intricate curvature of names, dates, and images on metal urns, Alvarez developed painful trigger finger. Surgery helped, as did a pneumatic machine that used air power to push the mallet, but eventually Alvarez switched to a computer-operated engraving machine. "In the beginning, they thought the computer would do it faster and easier than my hands," he said. "But if the urn already had your father's name and then here comes your mother's name, will you accept another font? How can I give the same look if I can't do it by hand and must use a computer?" Alvarez realized he had to teach the computer to engrave "by hand," but his first graphic instructions were too complicated. "The 'A' had too many paths," he said. "The computer told me I had to break the 'A' down into four parts to build a font." He used CorelDRAW, a graphic design program, to create a language the computer could understand. After designing unique graphics for each letter of a name, he exported the data to EngraveLab, software that communicates with the engraving machine. "It does the job, but without me behind it, nothing can happen," said Alvarez. Which is one reason finding Alvarez's successor will be challenging. Even someone who can type can't use his designs unless Alvarez makes thousands of alphabets for each style. Seventy to 80 percent of the urns he has worked on while at the Chapel are unique. To match the letters, they must be hand-engraved or created one letter at a time via custom graphic data. Beyond technical skills and knowledge, there is a less tangible but no less pivotal reason Alvarez's work is invaluable. It goes back to Farvall's one-word summary: care. A family who paid particular attention to brush stroke length and width, a reflection of royalty versus peasant social status in their culture, was pleased that Alvarez took the time to learn the difference. "It mattered to him to meet the family's expectations," recalled Farvall. Alvarez once engraved a specific piano, recreated from a photo, for a family whose mother was a piano player. Another time, he was asked to engrave on a bell — the curved surface required a sophisticated hand and guesswork, as he did not know in advance the exact hardness of the metal. "I took my chances and luckily everything went well," said Alvarez. Madden said luck has little to do with Alvarez's craftsmanship. Instead, he spoke of deep commitment. "He knows that an urn communicates permanence and should be treated with that level of care," he said. Alvarez's eyes often fill with tears as he speaks of his work.